It’s no surprise that Gem and Mineral Shows dot the calendar in the late summer months. At the end of prospecting season, there are many great finds and stories to be shared. We recently visited three of central Colorado’s finest small shows. Pictured at the right is Claudia next to a huge smokey quartz crystal from the Lake George Show. See more on that below. 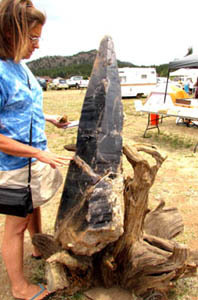 The Contin-Tail is held annually just outside the town of Buena Vista, Colorado on the second weekend of August. 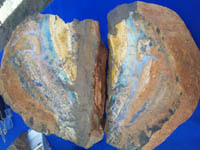 This show has many local vendors who specialize in the minerals of the area or region. This year, there were a few surprises, though. Not a local, but definitely a gem favorite, is the Australizan Opal. The photo below shows a 10-inch vein of beautiful blues, greens and pearly whites. The dealer boasted both sides of the vein…a rarity with an appropriate price tag of more than $6,000.00. Antero Aquamarine, some of the most spectacular in the world, is available from many vendors. Being able to buy directly from the prospector is a special treat for they can share adventures that come with being on the top of 14,000-foot-plus Antero. She’s famous for intense and quick-moving electrical storms. 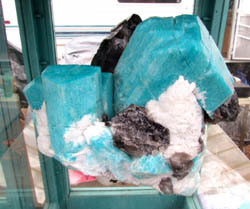 The Busse family is well known in this area for their excavations of brilliant aquamarine. The Lake George show is located in the heart of amazonite and smoky quartz mining. You’ll rarely see amazonite with the depth of color found in the Lake George area. Here a small, but impeccably paired specimen of amazonite and smoky quartz can cost over $100.00…and be seen as a bargain. The special thing about this small show this year was the 4-foot-tall smokey quartz specimen. A long time favorite, this was the last year for viewing--and touching-- this spectacular find. It will soon call the Colorado School of Mines in Golden, CO its home. The same miner responsible for this find had re-discovered a vein of incredible pink topaz this year. Brilliantly clear with just a hint of pink color, these pricey specimens were truly a treat for the eyes. We moved on to the Woodland Park Gem and Mineral show which was quite a bit bigger than the Lake George. There was a lot of variety: more jewelry, a few artists, some silversmiths and small retailers. Having visited on the last day of these shows, we got some great bargains. We thought we’d hit the mother lode when we met up with a prospector who was anxious to sell some of his large stock at rock-bottom prices just so he didn’t have to cart it back home. Usually our strategy is to arrive early at shows so we can get “the good stuff” before it’s picked over, but in these small shows, it seems like the opposite strategy may work in our favor. Soon, gem collectors will be able to view incredible specimens of wulfenite, amazonite, and smoky quartz on www.fossilicious.com …and we can pass along our savings to you! We finished up our day of rock-shopping with a stop at the Rocky Mountain Dinosaur Research Center. This is one amazing little dinosaur museum tucked away in Woodland Park. It boasts the largest collection of marine reptiles on display in the WORLD! They even have a huge tylosaurus, the second largest mosasaur ever found. It snakes its way through the room and is surrounded by a dozen smaller marine reptiles. Spectacular! 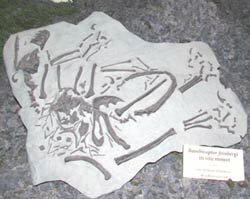 The research center holds a huge lab that is used for extracting and preparing fossil specimens as well as creating full-sized replicas, many of which are on display and for sale at the museum. They have an extensive gift shop with educational toys and gifts for your favorite dino-lover. The Dinosaur Resource Center is a must-experience spot for kids of all ages!